There was growing interest in South African music during the 1980s. The initial impetus came from the Soweto uprising of 1976 and the surging freedom movement against the racist apartheid regime. In 1983 the compilation Zulu Jive: Umbaqanga (Earthworks ELP 2002), released in Britain, was the first exposure many of us outside of the country had to the down-home, funky sounds of urban South Africa, and its sequal, The Indestructible Beat of Soweto (Earthworks EWV 14, 1985), kept the momentum going. Indisputably, though, the event that really put Black South African music on the map internationally was the release in 1986 of Paul Simon's LP Graceland. Initially quite controversial, it was recorded in part in Johannesburg with veteran studio musicians. Graceland brought international fame for the a capella singing group Ladysmith Black Mambazo and ensuing tours by Simon with Hugh Masekela and Miriam Makeba revived their careers as well. Of course, the success of Graceland meant that record companies were in a rush to put out more product for the growing international market. Most of these releases were on smaller independent labels, but the bigger companies got in on the act also. 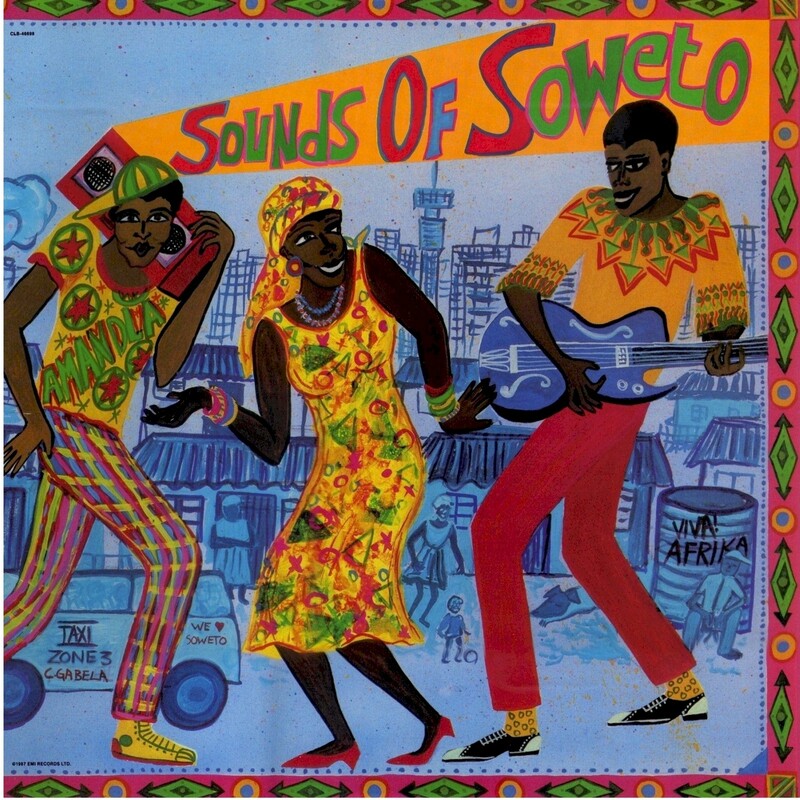 Among the most notable of these latter releases was the double LP set Sounds of Soweto, issued in the US in 1987 by Capitol Records/EMI (CLB-46698). Sounds of Soweto got such widespread distribution at the time that I was surprised to discover that it has long been out of print. Apparently it was never reissued on CD and is not even available through downloads or streaming services. What makes this oversight all the more notable is that Sounds of Soweto highlights a style of music that, while lacking the rough edges of umbaqanga and other earlier styles, was wildly popular in South Africa at the time - the synth-driven and disco-inflected "bubblegum music" of artists like Brenda Fassie and Condry Ziqubu. This music is being rediscovered through the efforts of people like Dave Durbach ("DJ Okapi") and his Afro-Synth blog and record store in Johannesburg. I'm happy to present Sounds of Soweto for your listening enjoyment today. The descriptions of the songs are taken from the liner notes of the album. You will note that for all the upbeat sound of these tunes, their lyrics are hardly frivolous. "A song about drought and the suffering it brings. It tells of a time when mealie (maize) meal, the staple diet of the majority of South Africans, was in such short supply that the people were forced to eat inferior grades to which foreign substances had been added, turning it yellow in colour." "Most black South Africans live without access to electricity for cooking, lighting or heating. Amalahle (coal) remains a prime commodity in the townships and the coal vendor an important community figure." "Life in South Africa's black townships is lived against a backdrop of violence and conflict, a situation powerfully reflected in the Zulu chant which runs through the song. It translates as: Confusion everywhere, everthing is burning." "An old story - naïve country boy leaves home for the bright lights of the big city, falls in love with slick city girl who breaks his heart and takes his money. Penniless and disillusioned, he sings 'Mali Kuhaba' (there is no money) and longs for the sinple rustic existence he left behind him." "Great quivering chunks of joyous funk. Pure celebration." "A shadowy figure in Soweto legend, the Gorilla man employed a henchman who would abduct beautiful women of the street and deliver them up to his master's brutal pleasure." "An instrumental whose title means 'What are you doing to me?' Unclassifiable, but undoubtedly African, undoubtedly danceable." "Dark street, bad night, bad town. This time it's some lawless piece of Soweto. But it could be any city - the feelings remain the same." "This is a tribute to Nelson Mandela and others who have made tremendous sacrifices in the struggle for a free and just South Africa." "Light-hearted, yet moralizing. A song about a rich old woman slaking her appetites on young men." "A cheeky love song directed at a young woman glimpsed on the street. The title means 'Sweetheart,' and this is followed by increasingly risqué wooings as the courtship progresses, township style." "The message, one of spreading love and harmony through music, is hardly new. But it has seldom been more relevant than it is in South Africa today." "Third World Child desribes the forced route march that Third World cultures have experienced in order to survice both colonization and modernization." "Although on the surface it is a song of admonition directed against a woman who fails in her duties towards her husband and child, Ramasela nevertheless has biting political overtones; it is after all the apartheid system which has put black family life so much at risk." "Textures of township life, this time a warning to a gangster, who, while pretending to look into shop windows, is actually sizing people up for mugging." "Speaks for itself, doesn't it?" Download Sounds of Soweto as a zipped file here. The zipped file includes complete scans of the album cover and liner notes, which feature information about the artists. Also, if you enjoy the music in this record, I can't recommend the blog Afro-Synth enough. Its proprietor, DJ Okapi, has compiled a number of great compilations of South African "bubblegum music" of the '80s and '90s.